Launched in 2008, the Learn at Work website currently has an average of 30 courses running daily, with approximately 3,000 active participants in both our facilitated and self-directed formats. 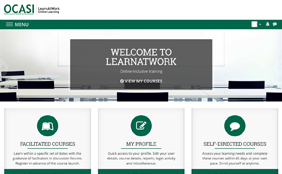 LearnAtWork.Ca contains a collection of online learning courses created and hosted by OCASI. Many of the courses are online versions of OCASI's in-person training. The topics are mainly on skills in working with clients. We also host courses by other agencies as a social enterprise. This self-directed training covers barriers to wholistic settlement services for newcomers with disabilities experience. It is specifically targeted to train frontline settlement workers and management staff. This online course was designed to with the intention of bringing greater attention to this marginalized group so we can continue to work together with supporting their integration. This course is also offered in French. This self-directed course is designed to build on your existing financial management skills by enhancing your knowledge of Financial Statements & Reports; Budgets, Forecasts & Reserve Funds; Financial Analysis; Audits; Financial Sustainability and Risk Management. This self-directed training is targeted at frontline settlement workers, who have little to no experience in employment counselling. It explores how to do a basic assessment of a client's employment needs, the employment services, how to build partnerships with and make effective referrals to employment services. This course is also available in French. This self-directed course addresses the issues of mental health and the unique challenges that immigrants and refugees face that may increase their risk of developing mental health difficulties. This course is also offered in French. This self-directed online course is designed to provide you with the knowledge, skills and tools to assist you in increasing the capacity among immigrant and refugee youth as a means of building an inclusive Canadian society and contribute to the prevention of crime. This self-directed training aims to support the immigrant and refugee serving sector to more effectively serve LGBTQ (lesbian, gay, bisexual, trans, queer and/or questioning) newcomers. This course is also offered in French. This 5-week self-directed introductory-level course is to help frontline practitioners working with immigrant and refugee communities to better understand issues of sexual violence and develop a supportive response for survivors. The focus will not only be on abuse that can occur within intimate relationships but also sexual violence that is perpetuated by family members, friends, acquaintances, those in positions of power and strangers. The LearnAtWork.ca website is run by OCASI. Courses are funded by a variety of funders including the Province of Ontario and Immigration, Refugees and Citizenship Canada (IRCC).